New computer simulations reveal how the early universe would have appeared 500 million years after the theoretical Big Bang. According to the standard Big Bang model, the universe was born about 13.7 billion years ago in a burst of inflation, growing from something smaller than the size of an electron to about golf-ball size within a fraction of a second. In its early stages, the universe was flooded with energy, which congealed into particles and the lighter atoms. Over time, as the cosmos continued to expand on a vastly greater scale, these atoms clumped together into stars and galaxies. "We wanted to see what the very early universe [and] galaxies looked like at an early time, very shortly after the Big Bang," said Carlton Baugh, a Royal Society Research Fellow in the Department of Physics at Durham University. The results will hopefully shed light not only on galaxy formation but also on the mysterious stuff called dark matter that makes up about 85 percent of the universe's total matter and is thought to act as scaffolding on which galaxies matured. "We are effectively looking back in time and by doing so we hope to learn how galaxies like our own were made and to understand more about dark matter," said lead study author Alvaro Orsi of Durham University's Institute for Computational Cosmology. "The presence of dark matter is the key to building galaxies – without dark matter we wouldn't be here today." 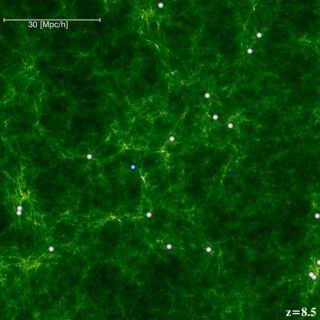 The researchers used a computer simulation of dark matter and added to it normal, or illuminated, matter. The resulting images show what the universe might have looked like at 590 million years after the Big Bang, 1 billion years after the Big Bang, 1.9 billion years after the Big Bang, and today. While dark matter likely started out in small clumps that got larger over time as gravity pulled those stretches of dark matter together, that's not what the researchers found for normal matter in galaxies. "The picture we have shows there are big galaxies in place at a very early time," Baugh told SPACE.com. "So galaxies are forming stars at very high rates." And although the galaxies are biggest at the present day, their rate of star production has dropped greatly compared with the rate in the early universe. The model also indicated that not all dark matter pools are conducive for galaxy formation. "Not all dark matter clumps are as good at making galaxies," Baugh said. "The conditions have to be just right to make galaxies." He added, "The dark matter structure that contains the Milky Way, our galaxy, is the best at forming stars and galaxies. That's the best scale to be on." The research is published in the Monthly Notices of the Royal Astronomical Society and was funded by the Science and Technology Facilities Council and the European Commission.